Cauliflower mash: good, three stars. A basic. Butter chicken: very good, four stars. Easy and tasty. Makes me feel sorry for people on low-fat diets. Maybe add a bit of grainy mustard as well next time? I used a few tablespoons of dried mushroom powder instead of mushrooms as I happened to have some and my son does not like the texture of mushrooms. Chopping them very finely would have worked as well, I'm sure. We've been told for years that eating fat is bad for us, that it is a primary cause of high blood pressure, heart disease and obesity. 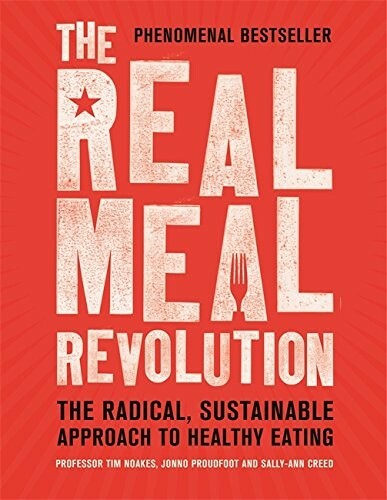 The Real Meal Revolution debunks this lie and shows us the way back to restored health through eating what human beings are meant to eat. This book will radically transform your life by showing you clearly, and easily, how to take control of not just your weight, but your overall health, too - through what you eat. And you can eat meat, seafood, eggs, cheese, butter, nuts . . . often the first things to be prohibited or severely restricted on most diets. This is Banting, or Low-Carb, High-Fat (LCHF) eating, for a new generation, solidly underpinned by years of scientific research and by now incontrovertible evidence. This extraordinary book, already a phenomenal bestseller, overturns the conventional dietary wisdom of recent decades that placed carbohydrates at the base of the supposedly healthy-eating pyramid and that has led directly to a worldwide epidemic of obesity and diabetes. Both a startling revelation, and as old as humanity itself, it offers a truly revolutionary approach to healthy eating that explodes the myth, among others, that cholesterol is bad for us. This is emphatically not just another unsustainable, quick-fix diet or a fad waiting to be forgotten, but a long-delayed return to the way human beings are supposed to eat.